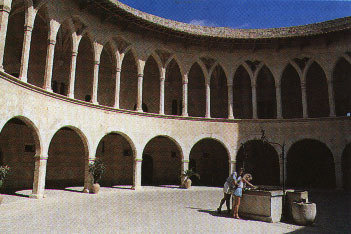 ' Bellver Castle (Castell de Bellver ) is a circular castle on a hill near Palma de Mallorca on the Island of Majorca , Balearic Islands . It was built in the 14th century for King James II of Aragon . It was used as a military prison during the 18th and 19th centuries. Now it is one of the main tourist attractions of the island. Looking up at this castle, so perfectly maintained, it is hard to believe that it has been standing for almost 700 years. Begun by Jaume II in 1300 and built by Pere Salva, the architect of the Almudaina Palace, it is unique among Spanish castles in being entirely round. Three large towers surround a central courtyard, connected by an arch to a free standing keep. The courtyard itself is on two levels, the ground floor with semicircular arches and a flat roof, the upper level with Gothic arches and rib-vaulting. For the full effect, walk around the moat then climb onto the roof and look down into the courtyard to compare the contrasting styles. While you are there, look out over the city and the bay for one of the best views in Palma (Bellver meant 'lovely view' in ancient Catalan). For many centuries the castle was used as a prison; Jaume III's widow and sons were imprisoned here for most of their lives. These days it contains Palma's museum of municipal history which traces the development of the city through its artifacts, with pottery from Talaiotic, Roman, Arab and Spanish periods. It was used as a prison in the 1950s, a period where many people where still being prosecuted for their loyalty and commitment to the Republic during the Spanish Civil War 1936-39. After the Civil War, the insurgents, being victorious in part through the aid of National Socialist Germany and Fascist Italy, and also the reluctance to come to the aid of the democratic Spanish Republic by such major European powers as Great Britain and France, the leader of the Nationalist-Falangist rebellion, Franco, established a dictatorship that would last until his death in November 1975. 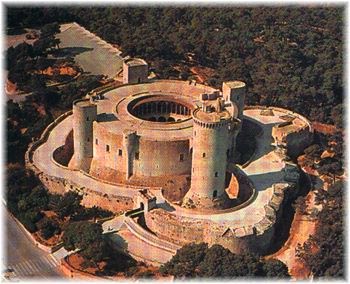 Some estimates put the total number of executed prisoners in Spain in the first decade of the dictatorship as high as 60,000, some of whom may have spent time incarcerated in Castell de Bellver. The intellectual and writer Gaspar Melchor de Jovellanos was one of the most famous prisoners of the castle. You can get there by car or taxi, or take a bus to Plaza Gomila and climb up through the pine woods above Carrer de Bellver, passing a chapel on the way. Pictures from Castell de Bellver - Palma de Mallorca. superb views over Palma Bay.